Last week, my brother, Andy, and his partner, Judy, lost a very special friend. Moose lived a life most dogs (and many people, too) only dream about. A cross between a Brittany and a Golden Retriever, Moose received the best qualities from both breeds. 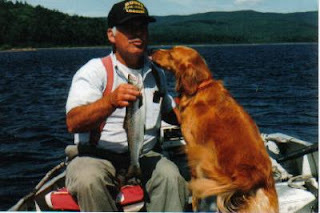 He proved to be a fantastic bird dog and loved the water as if he were born there. I remember Moose as a puppy. He overcame many health problems, and this tenacity showed us what a super dog he’d become. This is a bit embarrassing to admit…I envied Moose’s lifestyle. 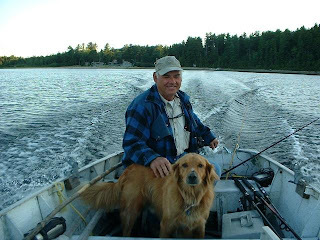 Andy, a Master Maine Registered Guide, spends the majority of his time in the woods or in a boat. Many summer days at work, my mind wandered to Andy and Moose trolling around a wilderness lake fishing. I could picture Moose sleeping in the bottom of the boat, soaking up the sun or standing in the bow, enjoying the wind in his face. Yeah, that’s where I wanted to be. Now I know the true meaning of “lucky dog.” What dog wouldn’t give up his special toy to trade places? Moose enjoyed a long life where he brought joy and love into Andy and Judy’s lives. In turn, they adored him and made his time on earth a special one. Right now there’s a hole in their hearts, but in time, Moose will sit gently in their minds, and his memory will bring smiles to their faces. Moose’s spirit now runs free. 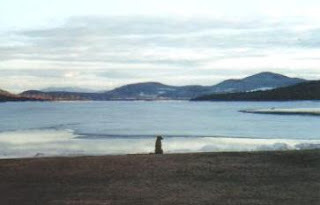 He’ll hunt birds, sit on a peaceful lakeshore and swim a few laps to cool off in the summer’s heat. I’m sure he’ll also find something smelly to roll in. Farewell, Moose. You’ll never be forgotten. You can bet this special dog will be in one of my novels someday. Oh, Pam he's beautiful. You can see how much he and Andy love each other. Those pictures are priceless. Especially the one at the end. Wonderful pictures. I'm so sorry for all your loss. I know how much pets can become a member of your family. Pam, that's a wonderful tribute. Brought tears to my eyes as I remembered by own special friend, Pattipan. Maybe she and Moose are romping through the woods together. She did love to escape through the fence every once in a while. My thoughts are with your brother and his wife. I know how sad a time it is. I join you and your brother and Judy in the dark shadow of grief for their beloved friend, Moose. He was a beloved friend and I know their hearts are broken. I ubderstand the emotion of great loss and and would only tell them to hold close the memory of his warm love bestowed on them. I sorrow with them in this terrible loss. What a touching tribute you left to Moose. He sounds like he was a very special dog. He's beautiful too. My eyes are all watery. :( I'm sorry for yours and your brother and his wife's loss. It sounds like it's affecting you all deeply. What a beautiful tribute to a beautiful dog. I can tell he was a great dog and much loved, a member of the family, like my dog. Now he's doing as you say, chasing and splashing in Dog Heaven. What a gorgeous dog. I almost cried looking at the picture. We hd a similar situation with our cat four years ago. she was seventeen years old, and when my husband had critical lung surgery that cat sat on the pillow next to him for six weeks while he recuperated. When we had to put her down it wa unbearably devastating but we have such good memories. I know Moose has left a legacy of friendshsip with your brother. Moose looks just like my dog Finn who we lost last year. I am so sorry for the loss, but beautiful pictures and happy memories. 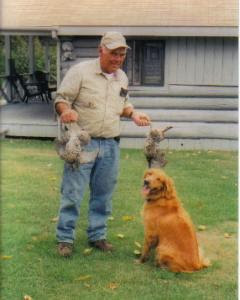 I look at him and I see my wonderful golden-mix, Jake, who loved to eat the baitfish. Hopping over from the Twolips chat. What a lovely dog. I love dogs and they become so much a part of the family. It's so sad when they pass on.